Not all heroes wear capes, some wear fur. Scotty saves the world one lick at a time. The Hero is a large visual element that can be added to the top of any page, like the ones on this page. We call this a Hero because it's here to save the day from lackluster websites! A Hero can be photos, News Articles, or a silent YouTube video with options to overlay text and add links. A Hero is optional, but who doesn't need a Hero? We know that working with large images can be frightening, but just remember a Hero is our friend. Here are some of the top concerns we've heard and why you should have no fear. I have no time, money, or resources to obtain large Hero images for my website. Are Heroes for the privileged few? AS IF! Heroes are for everyone. If you're not able to obtain high resolution images for the Hero, we have FREE Hero images readily available for all CMS sites. And they're pre-sized so you just need to download, plug and play. 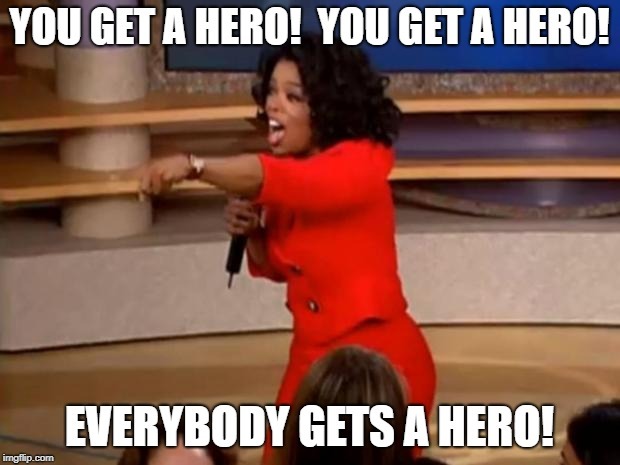 Come get your free Heroes! What sizes do my Hero images have to be, and why do I need two versions? Sorry for the extra work, but providing two versions of the Hero will ensure the image will look great on a variety of displays. You do want your website to look nice for everyone, don't you? Can I use any YouTube video? And why do I also need to upload images when using a video? While any YouTube video should work in the Hero, you should only use videos in which you are authorized to use, and which are suitable for silent play (all videos are automatically silenced). The images serve as a backup for circumstances in which playing a video is not ideal. Not everyone has accesss to YouTube, and if mobile devices streamed videos all day long they'd run out of data and we'd be in big trouble. Free Heroes provided to all CMS sites! Be sure to also check out the Optimize Images page for guidelines, tips and resources to make your images sparkle! 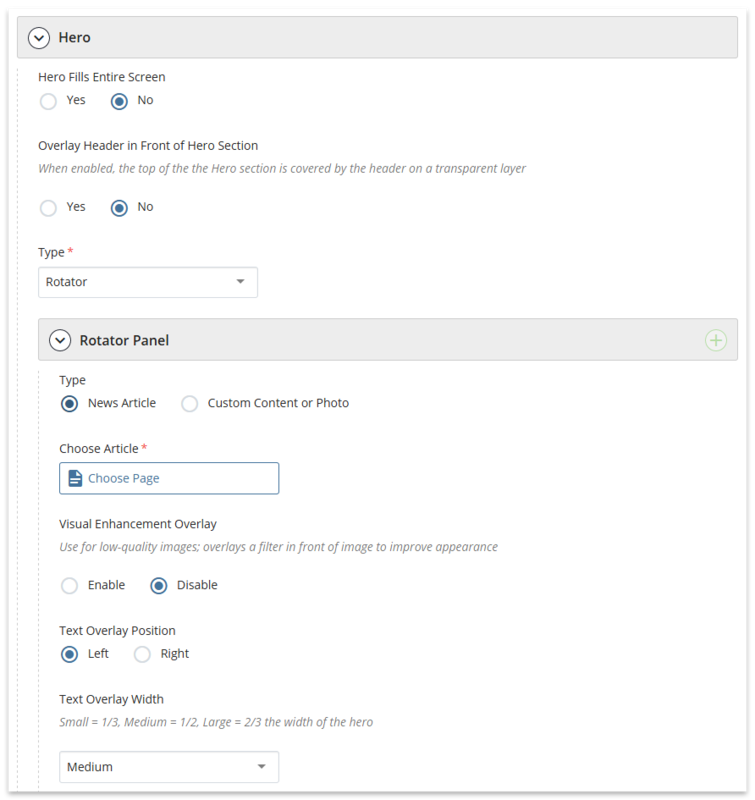 Hero settings in the page edit interface. To feature news articles in the Hero you must have an established news section on your site. Click the plus sign (+) to add more news articles (up to four), repeat steps 1-3. Enter the YouTube video ID; the video ID is the number/letter combination after the = in the video's URL (e.g., https://www.youtube.com/watch?v=hAdHQCNtGUk). 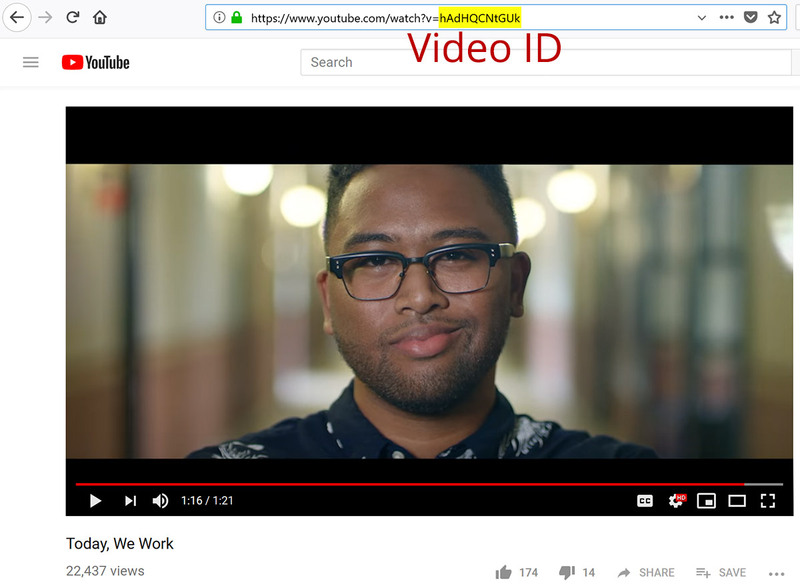 Portion of URL highlighted in yellow is the video ID. Whether you use a rotator or silent background video for the hero, you can overlay text using Centered Text, Text Box and Caption. Character limits for each are provided in the edit interface. Note: Rotating news articles are preconfigured to use text box overlay, but options for position and width are configurable. Tip: Not all Heroes are ideal for centered text as text color is white. If centered text doesn't look good on your Hero, try using a text box instead. Tip: Captions should be used as commentary for the image. Captions are not available when option for Hero Fills Entire Screen is enabled.